I'm trying to find sardines in a can that has to be opened with a key, not the pull tab kind. Any idea where I can find that type, or do they not even exist any more? Can any of you sardine affecionados tell me if cans are still available with a key??? It was a hungry soul way back in the second half of the 19th century who invented the key to open tins. 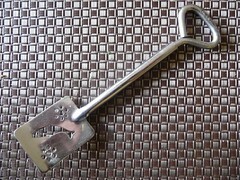 In 1920s the hand cranking, serrated edge can opener still used today was invented, but still the tins came with keys attached in one way or another. In the late Fifties the pull tab tin was devised. I remember seeing tins with keys attached when I was a kid back in the Seventies but I haven't seen any tins like that in this century. So, I put these questions to the Society. Are there any tins with keys attached still in production? Have You seen any anywhere? Go look in Your Grandma's cellar, behind all the jars of pickles, jam, and veggies. I don't know if You should eat them, but We want to see them. Probably shouldn't even open a sweet antique tin, but if I found more than one of the same label I would have to pop one open. Just Cause. This is a question for me ! I think you won't find any new key opening can. In Europe, it's been removed from authorization in 2001 or 2. There are only a few can manufacturers in the world, canneries use machines to close the cans that are devoted to the cans that are sold to them. They all have been replaced by the lid system called E.O.L.E. (Easy Opening…) in english and B.O.F. in french (Boite Ouverture Facile). As the system is brevetted by Crowncork.com, other can factories don't use opening system.